Come enjoy the final show of the year! 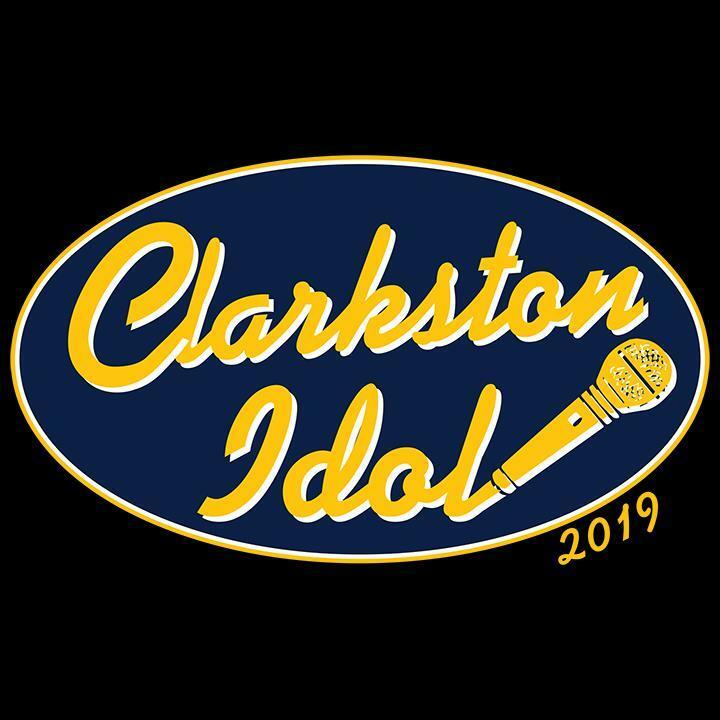 Come cheer on and vote for your favorite contestants at Clarkston Idol 2019! 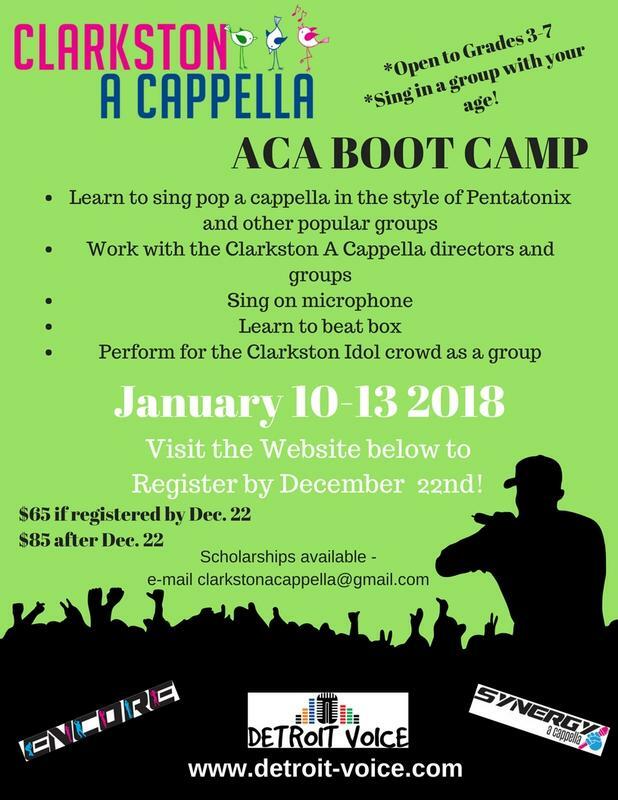 Also performing will be Aca Boot Camp and the Clarkston A Cappella program (Detroit Voice, Synergy, and Encore). Proceeds from this event benefit the Clarkston A Cappella program and cover expenses for Clarkston Idol. The final concert of the year for the Clarkston A Cappella program. 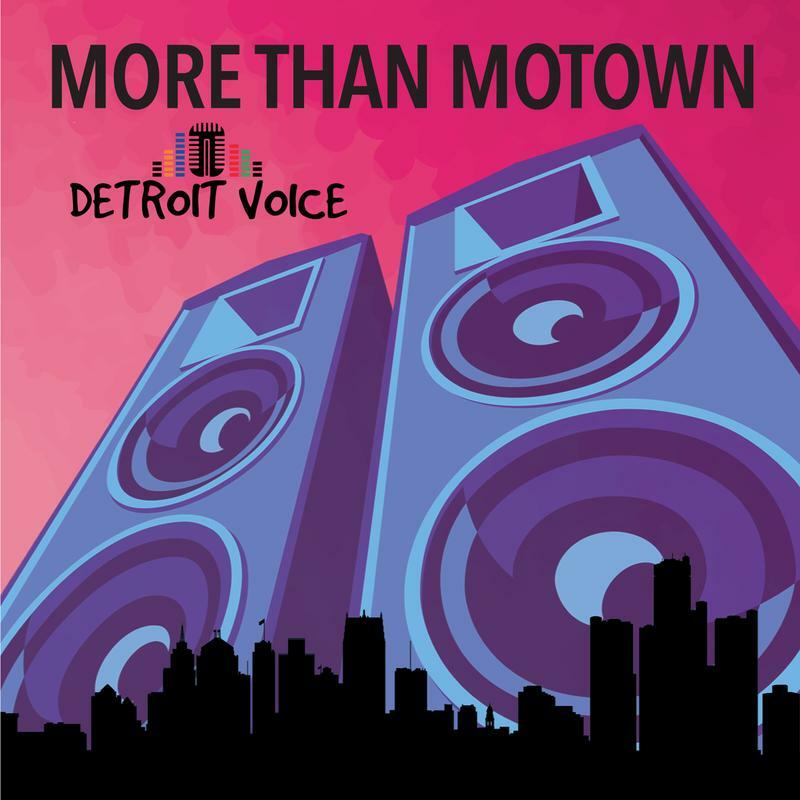 Featuring Detroit Voice, Encore, and Synergy! 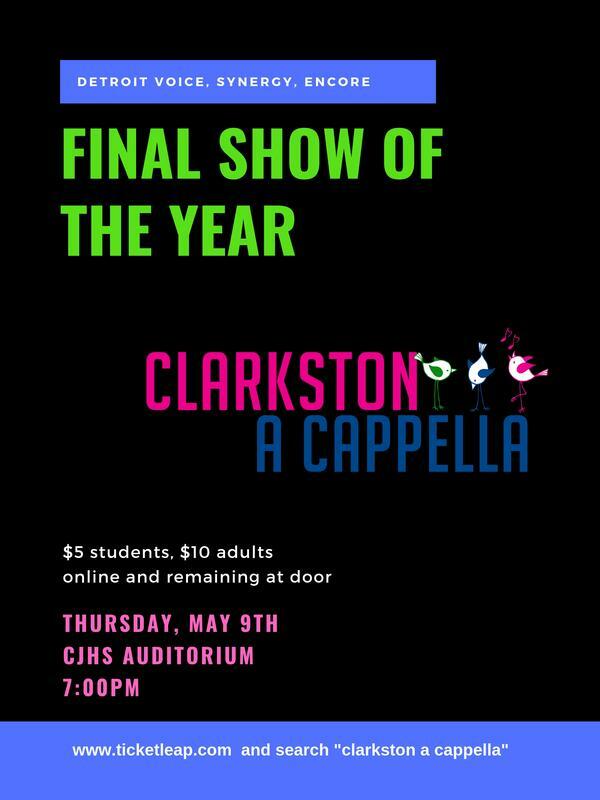 Come out and support your favorite Clarkston Idol finalists. 30% of results from live Twitter polls, 70% from judges. Special performances by Maddy Kopsch (original acoustic music) and Clarkston A Cappella. Here is where you pay your audition fee for Clarkston Idol. This fee covers the cost of awards and supplies for the show. Please print your receipt and bring to the audition. 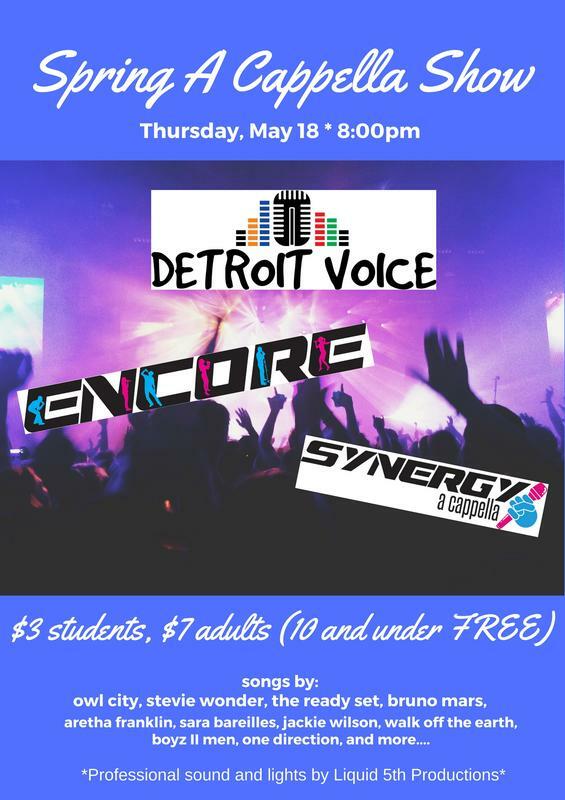 End of year show for Detroit Voice, Synergy, and Encore. 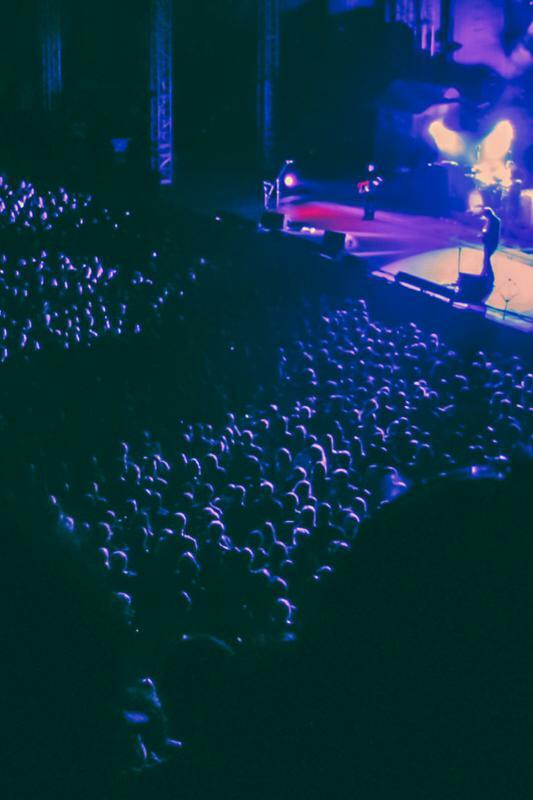 Professional lighting and sound from Liquid 5th Productions. Songs by Owl City, Stevie Wonder, The Ready Set, Bruno Mars, Aretha Franklin, Sara Bareilles, Jackie Wilson, Walk off the Earth, Boyz II Men, One Direction, and many more! Come cheer on your favorite singers and beatboxers as they try to become this year's CLARKSTON IDOL! 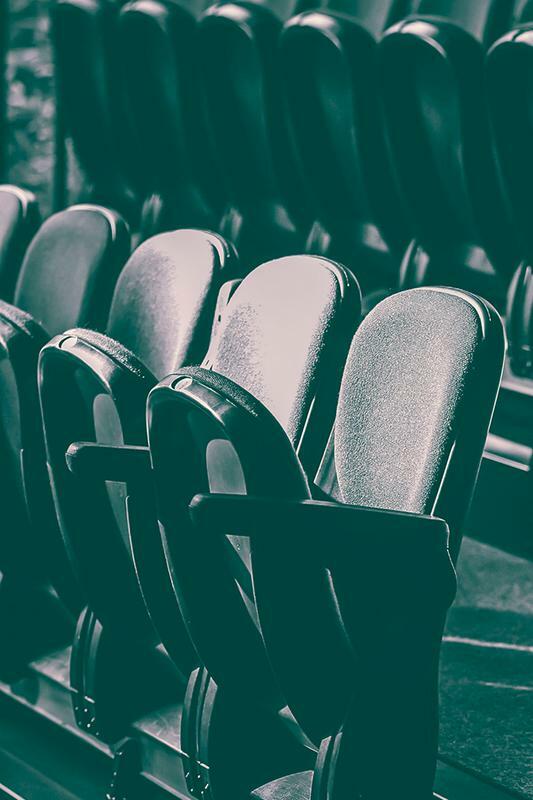 This concert will feature all 3 Clarkston a Cappella groups (Encore, Synergy, and Detroit Voice) as well as guest groups TBD a cappella, Avenue A Cappella, and professional group THUMMp. Proceeds from this event will benefit the Clarkston A Cappella program's efforts to record a new CD.